The Sennheiser PX 100 headphones boast superior sound quality partnered with unique, sleek and convenient fold and flip design. High resolution sound is made possible by Sennheiser â€œDuofolâ€ diaphragms with spiral embossing. The PX 100 headphones are incredibly lightweight (65g) and with easily replaceable ear pads and headband padding, you donâ€™t have to worry about normal wear and tear ruining your investment. For brilliant sound reproduction and cutting-edge design, Sennheiser is the name to beat. I bought 2 pair of these several years ago on U-bid auction for less than $10 a pair. I wish I would of bought a few more. They are awesome. I have had the highly acclaimed Grado Headphone and these easily match up with them. I recently tried some in ear models from Sony & TDK and their audio quality does not hold a candle to the quality of the PX-100's. I've been using px100s for something like 7 years now, the last five or so actually for portable audio engineering - these (alongside the similarly great Koss Portapros) are the best headphones I have listened to in the sub £50 range (iGrados might be great too, though I've not listened). I've been using these headphones for most days of the week throughout these years, listening to all sorts of genres, so I reckon I am incredibly familiar with their sound. I recently bought the successor px100-ii weary of warnings, such as below, that the model has changed for the worse. Let me say this - I can't hear a damned difference. They sound EXACTLY the same to me, the same great sound as the predecessor. I have read that they use the same drivers so if that's true, the only difference is that the band and cups are made with sturdier plastic - enough to make a difference? Not for me, but maybe for those with a larger head... The only thing I can think of is that the sturdier design lead to the headband being, I think, marginally tighter so maybe these upgraders are just hearing the effect of having the phones pushed closer to their ears. I highly doubt the type of plastic on the cups themselves has anything but a negligible effect given that these are open back headphones anyway. If you can get your hands on either, go for it. Again, they sound the exact same to me. Quite simply stunning! I use these on a daily basis, and I am very careful with them as I have heard horrible reports of their replacements. For the money, I really don't think you can get better. No over reliance on bass or treble, just well balanced sound. Mid range IS present, unlike with some 'phones. I bought a pair for my son, and I have been tempted to borrow them permanently and get some others for him. I will look at some ie6's soon for travel, but I know that I may be disappointed with them, simply because the PX100's are that good. Without any doubt the best value in the world of headphones. Everything about it sings. It has deep bass, without the unnatural midbass hump so frequently imposed on headphones at all price points by their manufacturers. You can actually feel the drive and rythym of ths music. All kinds of music, from bass-heavy rock to folk to classical, including Mozart on original instruments which is what I'm listening to now. I have owned Grados from SR60 to SR 125, and Sennheiser's 580 and 600 models. Yes the latters give the PX 100 a run for its money, but at five to seven times the cost, and the result is not so clear. Yes the 600 goes deeper, but is it really better? and it is fragile and when it breaks you're out a lot more than if a PX 100 breaks. Which is why I have several "spares" at home, just in case. The reviewer here who said he prefers this model to his 650 is not insane, on the contrary I've been having a hard time justifying the existence of my HD 580. Caution: Sennheiser has discontinued this model, in favor of the PX 100-II. DO NOT BUY THAT MODEL. It is not remotely as good. They have given it the ridiculous bass hump then prudently denied this model, apparently in the belief that the market demands headphones that can pound out the big bass beat of hip hop. Maybe Sennheiser wants to compete with Dr. Dre and his monster-cable phones. Well I've tried them, and they were surprisingly not horrible, but these blow them away. The only flaws, if they are such, is that they have no noise-cancelling properties, thus they can't be used effectively while traveling. So, I have a pair of in-ear phones I use for those rare occasions, then when I get where I'm going I pop out the PX 100's again. Basically no upper end of the sound spectrum. Le casque d'écoute Sennheiser PX-100 offre un son magnifique avec des basses de belles qualités et une douceur dans le médium et l'aigu tout en ayant une excellente définition. Le port de ce casque est très aréable. Un cinq étoiles bien méritées. I paid $39.99 (reg, price) and I feel like I stole them. They made my Sansa Clip sound alot better as I'm sure they would any Mp3. They fold up to put in a case which is nice but it's the clean, accurate sound that grabs you. Blindfolded you'd guess what I listen to, setting tile set me back $500-750 (the Clip with it's eq. and $30 price tag ain't too shabby itself). The PX 100's are the best sounding Headphones I own and I have some very expensive ones. 5 out of 5 easily. I'm going to join the Sennheiser PX 100 love-in. 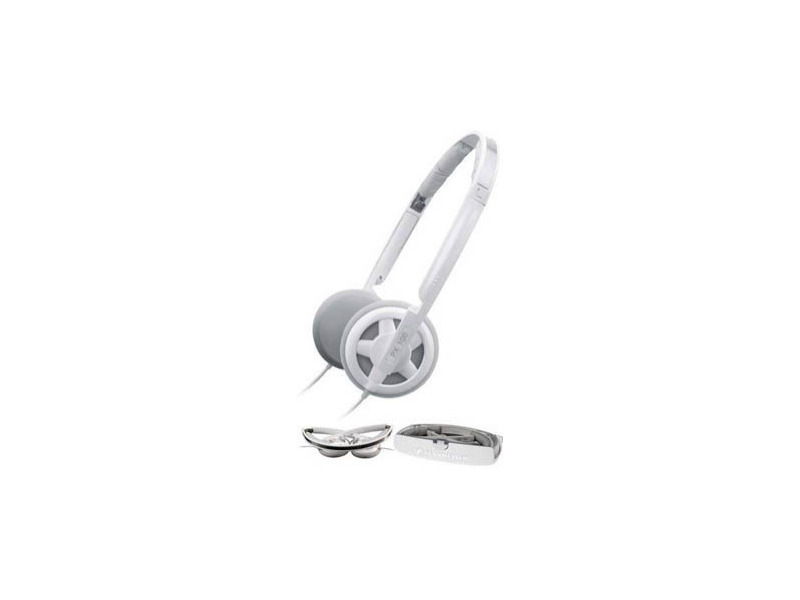 They are very good, well rounded headphones at a very reasonable price. The build quality inspires confidence (metal headband, nice heft). I've got Koss Porta Pros (my previous favourite portable cheapie headphones) that have broken and been replaced by Koss 4 times now. The PX 100s have had no issues in the year or so I've used them. They are comfortable for very long periods of listening. These won't put your head in a vice. No rattle, just punchy bass and clean mids. I just bought it yesterday from p.c show here in singapore and I compared it side by side with higher price tag with almost 3x the price, oh men,the sound is so awesome! , I am thingking why the company selling it so cheap, highly recommended !